Soschi: Championship leader Nico Rosberg took full advantage of his Mercedes teammate Lewis Hamilton’s continuing ill-fortune on Saturday when he secured a comfortable pole position for Sunday’s Russian Grand Prix. The 30-year-old German, who leads this year’s title race by 36 points after winning the opening three races in succession, clocked a fastest lap in one minute and 35.417 seconds to take the prime spot on the grid. This left him over seven-tenths of a second clear of Sebastian Vettel of Ferrari after defending three-time world champion Hamilton had been hit by another engine failure during the Q2 part of the qualifying session. Hamilton was unable to take part in Q3 and provisionally will line up in 10th place on the grid. For Rosberg, it was a second successive pole in Sochi and the 24th of his career, ensuring he has the best possible chance to tighten his grip in the championship. Vettel, who had stopped on-track during the practice session, is expected to start from seventh on the grid because he has a five-place grid penalty for a gearbox change on his Ferrari. Vettel is expected to start from seventh on the grid after because he had a five-place grid penalty for a gearbox change on his Ferrari. “I think for us it was a good recovery but I would have liked the gap to be smaller,” he said. 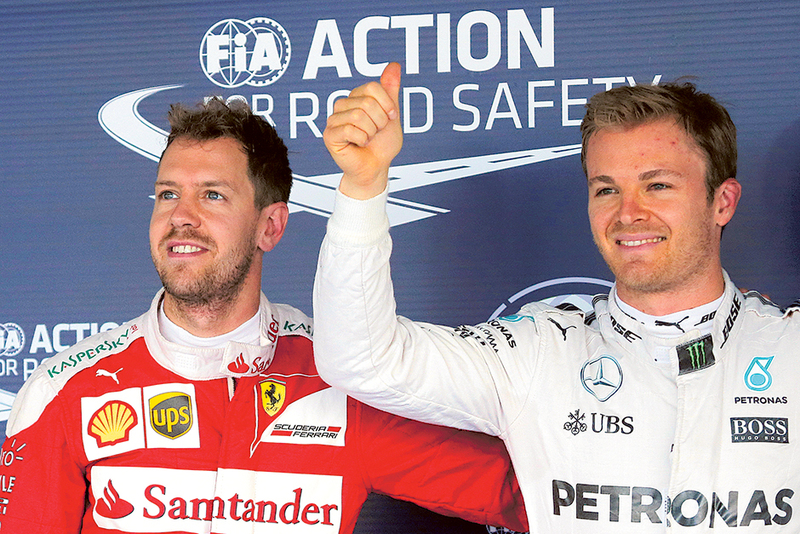 “Nico is very strong — but we have gained from what happened to Lewis. And I am starting, at least, from the clean side of the track! “I am not frustrated with Ferrari — this happens and it is all part of racing,” he added. Finn Valtteri Bottas of Williams outpaced compatriot Kimi Raikkonen in the second Ferrari to qualify third — and start second alongside Rosberg. Raikkonen was fourth ahead of Felipe Massa in the second Williams, Daniel Ricciardo of Red Bull, Sergio Perez of Force India and local hero Daniil Kvyat who was eighth in the second Red Bull. Dutch teenager Max Verstappen was ninth for Toro Rosso with Hamilton 10th. On a cool day at the Sochi Autodrom, all six drivers and cars from the Renault, Sauber and Manor teams were eliminated at the end of the Q1 session topped by Hamilton ahead of Rosberg and then the two Ferraris. Hamilton, however, was the subject of an investigation after cutting the corner at Turn Two, where Race Director Charlie Whiting had installed a bollard to make drivers stay on the asphalt. Hamilton’s best lap in 1:36.006 was slightly more than one-tenth faster than Rosberg and also the outright fastest lap recorded on the track built in the former Olympic Park on the shores of the Black Sea resort. In the cold conditions and with low-erosion tyres, the second Q2 session was competitive and concluded with Kvyat securing his place in the ‘shoot-out’ with a late flying lap. This signalled elimination for the two improved McLaren Honda men and the two Haas cars. Carlos Sainz was 11th in his Toro Rosso followed by 2009 champion Jenson Button of McLaren, Nico Hulkenberg in his Force India and two-time champion Fernando Alonso in the second McLaren. Romain Grosjean and his Haas teammate Esteban Gutierrez were 15th and 16th.